What can anyone say about Dinner by Heston Blumenthal that hasn't already been said? I mean, it was the most anticipated restaurant opening in London of 2011, and is still as popular judging by the difficulty in securing a prime-time table. That will get even harder now that Dinner has entered the hallowed ranks of the Top 10 best restaurants in the world at number nine. It even pipped its older brother The Fat Duck which sank to 13. Now, in my opinion, there is no way that Dinner is the 9th best restaurant in the world, one rank behind the incredible Arzak for example. That's not to say that you won't eat well at Dinner, because you most certainly will. You probably know what the shtick at Dinner is, right? It's all about renewing sometimes ancient British recipes and using modern techniques to bring them to life with Heston's usual flair, of course. We went to Dinner for Mr B's birthday a few weeks back. That was our third visit, which I guess makes it obvious we like the place rather a lot. The menu has subtly evolved from my first visit, although you will always find dishes like the signature Meat Fruit and Tipsy Cake (both of which you should try at least once). There are also daily specials to keep you coming back for more. For once, I forced Mr B to choose a starter other than the Meat Fruit (£14.50), which is the dish of the year in my view. On another occasions I've had the Savoury Porridge, the flavours of which are so fresh and vibrant it was like eating grass - but in a good way obviously. I've also tried the Rice and Flesh, which is a rich saffron risotto with meltingly tender oxtail. But the Meat Fruit is quite possibly the perfect dish. A lot of people agree too, as they sell 900 of these a week. It's a chicken liver parfait encased in a mandarin jelly and uncannily shaped into said fruit. The parfait is rich, but light and airy. The sharpness of the fruit jelly offsets this, making it incredibly moreish. Delicious. If someone on my table doesn't order this dish so I can have a mouthful, then I will order it again myself on every visit. Instead of the Meat Fruit, Mr B ordered the Buttered Crab loaf (£16) which was a newcomer to the menu. This was a tasty brioche, with a springy French toast consistency. The loaf is soaked in a crab custard before frying to achieve a beautifully caramelised exterior which is a great match for the sweet crab meat. For my main course, I went with the Spiced Pigeon (£33) which I've ordered once before. Like a lot of the meat at Dinner, this is cooked sous-vide to retain the delicate texture of the meat before being finished off on the plancha for a crispy skin and more flavour. The dish is served with baby artichokes and a great ale-based sauce. It's rich, but not cloying and is the best pigeon I've eaten. Mr B's main course was the special that day called the Beef Royal. They take beef short ribs and cook them, amazingly, for 50 hours at 56 degrees which means the meat retains a delicate pink hue despite the long and low cooking. Generally a fatty cut, the meat at Dinner was fork tender, with the fat having rendered. Before serving, the beef is seared on the plancha and presented in a slick-like rich beefy reduction. It's kind of a like a French daube, but so much better. Of the other main courses I've eaten or tried, I would also recommend ordering the chicken. While it might sound too ordinary a dish for a Heston restaurant, this is probably the best chicken you will ever eat. It's wonderful with braised lettuce and a spiced celeriac sauce. If you're looking for a side dish recommendation, go with the buttered carrots with caraway. With this most recent meal we also ordered some hispi cabbage, which seems to be popping up everywhere these days, notably and most deliciously for me, at Dabbous where it was served with king crab. With dessert, I moved into new territory after ordering the delicious Tipsy Cake twice before. We went with a Quaking Pudding (£10) and the Poached Rhubarb (£9.50). The pudding was delightfully wobbly with a light caramel sauce and served with soft pear slices for some sweetness. The rhubarb was another beautifully presented dish. The blushing pink rhubarb retained a little bite and was served with a rhubarb sorbet and speckled sugary wafers. A nice interplay of sweet and tart flavours. We finished the meal with a Heston flourish. 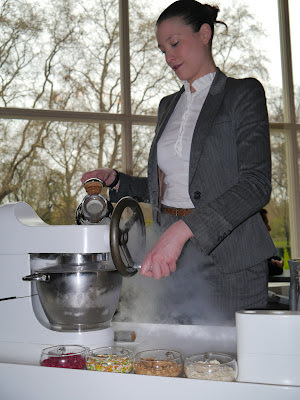 The post dessert is a relatively new addition to the Dinner repertoire and it's an ice cream made before your very eyes using that oh-so-HB ingredient liquid nitrogen. Expect lots of wide smiles from your own table and those around you as custard is poured into the frozen bowl and hand-cranked with the addition of the liquid nitrogen to produce a smooth vanilla ice cream out of the billowing clouds. You also get a choice of one of four toppings which are typically whimsical. I went with the popping candy and revisited my childhood with each lick. The post dessert needs to be ordered earlier in the meal giving the staff enough time to wheel the custom-made Titanic-looking ice cream-making vehicle to your table. Each time I've been to Dinner, which is two evening meals and one very long lunch, I've been impressed with the knowledgeable and friendly service. Staff have been drilled to expect questions about the menu and rarely fail to deliver. On every visit, the head chef Ashley Palmer-Watts has also been in the kitchen, which is a credit to his dedication. Dinner is one of the few restaurants where I would happily try everything on the menu. With main courses averaging just north of £30, it's relatively pricey, but not outrageously so for brand Heston. Certainly for the quality of the food and the service I think you could even argue it represents value for money. This is certainly true when I compare it to the meals I've had at various one Michelin star places in London. Dinner generally comes out on top thanks to the interesting menu, precision cooking and friendly, professional service. Put it this way: I've recommended Dinner to lots of people and not one has been disappointed. Come June 1st, I'll be taking my own advice and hitting the phone and the website trying to grab another reservation along with everyone else. I suggest you give it a shot too, but please let me have that table for five! great review i am going this sunday! when you say you ordered the ice cream earlier in the meal, when shall i ask about it? Hi Becki! I was told about the ice cream at the start of the meal so ordered it then, but I was at Dinner again two weeks ago (still great!) and they offered it to us around the dessert course so I don't think you'll miss out. Enjoy Dinner and report back!